When a pipeline crosses a road or a railroad track, a tunnel is drilled under the road and the pipe is pushed through, which is known as a road bore. 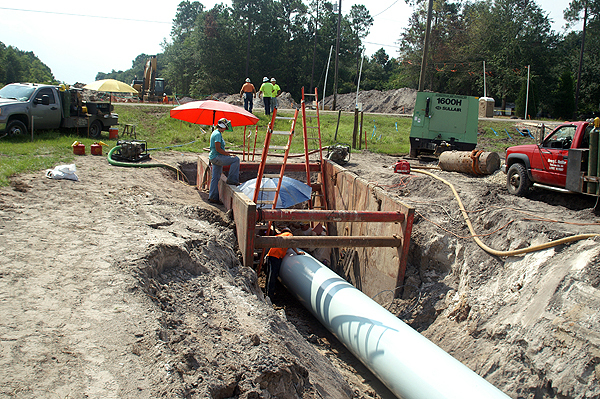 Once the pipe is under the road, the pipe is welded to the remainder of the pipeline at each end. The welding process has to be done in the trench, itself, which is a very tight space. The trench box, which is orange in the photo, maintains the integrity of the trench against collapse of the trench walls, thereby protecting the welder.. For the majority of the pipeline, no one is allowed in the trench due to the danger of wall collapse. However, at a road bore, the work has to be done in the trench. This entry was posted on Sunday, June 17th, 2012 at 10:57 am. It is filed under Corporate, New Images and tagged with pipe, pipeline, road bore, road crossing, trench, trench box, weld. You can follow any responses to this entry through the RSS 2.0 feed.